The present presents itself simply, when we stop, look and listen. When we say “our own presence” it’s important to see that, at bottom, there is no actual person – no real “you” remains to “own” the present. This is the present that cannot be opened by a “me” on the move.That’s what it means when some sages say:”Nirvana is cessation”. There’s no personal, proactive and preemptive “you” actually doing anything. Just the fullness of life, doing what it does. 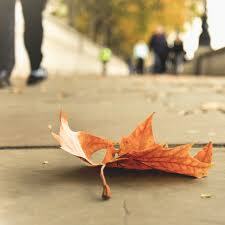 Stop, if only for a moment, and we inherit all the earth – right down to a fallen leaf. Stop, and we begin to see the magnificent work of God, or Buddha, or Love. When we stop, look and listen, deeply, we come into contact with our natural well-Being. We unwrap the joy and harmony that is always here in the present. We celebrate Peace on earth and goodwill to all.